The Eagles picked up another non-league win and are now looking to win at least six games in a regular season for the first time since 2001. No, No, No, oh, OK! For the most part, the rule is this: If it’s fourth down, knock it down. A defensive back should not try to intercept a ball on fourth down. Knock the ball down for an incomplete pass so the offense will get the ball at the previous spot. There are exceptions of course. Quadrese Teague is the exception. Teague opened the scoring against Mark Morris with a fourth-down interception and 62-yard return for a touchdown. He must have known he could return the ball at least to the previous line of scrimmage. And once he picked it, he knew he was gone. He looked like a blur sprinting past the Mark Morris offensive linemen trying to get to him. Speaking of sprints, Teague also leaned forward at the goal line as if he were trying to “break the tape” in the 100-meter dash. Defense set up the next Bay touchdown when Daniel Berdogin chased down a scrambling quarterback, tackling him short of the line to gain on a fourth-down play. A few plays later, the Eagles were in the end zone. Twice. Teague thought he had a 60-yard touchdown run. But a penalty must have brought it back. (In my video reviews, the penalties are not shown.) Next play, Marcus Cadiz broke free for a 65-yard touchdown. That made it 14-0, and the defense kept its focus the rest of the night. Bay would add three touchdowns in the second quarter to win in a runaway. Hudson’s Bay expects to pick up its second league win this week against a struggling Fort Vancouver team. Not saying the Eagles are overlooking the Trappers. Just saying they expect to win. Then there will be a matchup with Kelso in Week 9. That game will mean either making the playoffs, settling for a tie for third place with a chance to make the playoffs, or missing out on the playoffs altogether. It depends on the results from Evergreen and Prairie games. 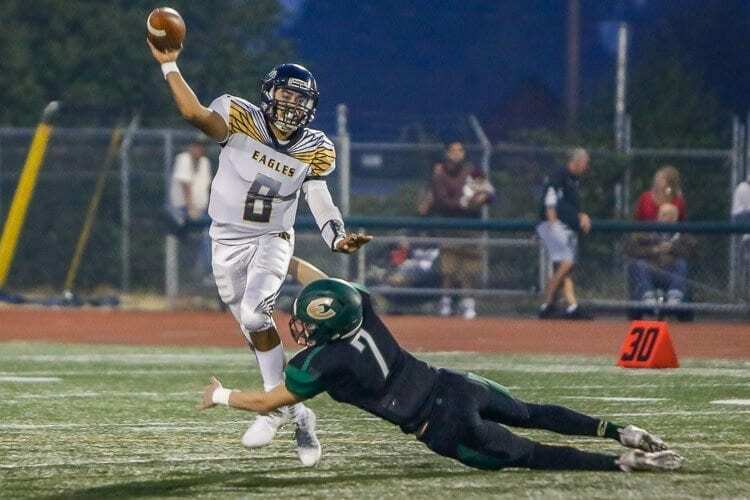 Should Bay go 1-1 in these two weeks, it is quite possible that there will be a three-way tiebreaker, just like last year, between Bay, Evergreen, and Prairie. 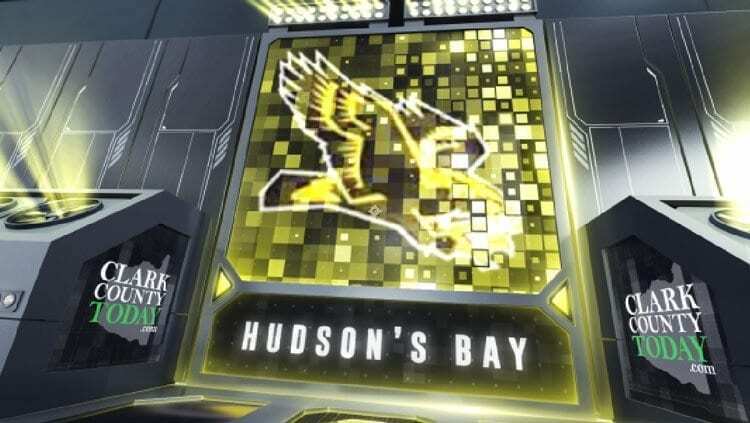 Should Bay go 2-0 in the final two weeks, then the Eagles would be soaring. What did Ray Lions think of his team’s performance in Week 7? “A near complete performance, but as usual there are little details to improve. Of course, that should be the norm for any coach until they win a championship. We suppose we could let a few mistakes go if we win a championship. “One aspect to improve are the penalties. We are getting to a big point of our season with two league games remaining that overcoming penalties can be difficult. This is two games in a row we have been penalized for over a hundred yards, but we have been fortunate to overcome with other aspects of our game. Those aspects are the special teams play, turnover battle, line of scrimmage, and air game. “A healthier Mark Morris would have definitely put up a stronger fight, but holding their offense to under a hundred yards (before the substitutions) is a first in my book. MVP on offense: “Tough call as a lot of credit should be mentioned by the offensive line. But this week’s MVP is Brian Perez,’’ Lions said. “Brian is an incredible young man who, long-story-short, has overcome many naysayers (and) obstacles. Once again, he was thrown a hurdle prior to the week and game, but his ability to compartmentalize is one of the many reasons he is a great quarterback. Thoughts on Week 8 vs. Fort Vancouver: “Big week for us,’’ Lions said. “This has to do with tradition, history, and pride. There’s a reason as to why alumni and staff remind me of the ‘Peace Pipe’ and the importance of it. Unfortunately, there were times for both teams that no matter the outcome, if you came out on top of this game, then it was a successful season. That is not our expectation. “Respect our opponent and the tradition that has gone on for years. This is a meaningful game that a lot of alumni take pride in and enjoy. A lot of programs will claim rivalries but few have as much of a rich history and formal procedure as the Peace Pipe game. This is a memory that many seniors will take with them as they go their different pathways. … We look forward to the matchup and hope to see the community just as excited as we are.